Design and coding junkie. Starting DBL MEDIA as a one-man operation, quickly grew with a reputation for clean modern design. He now acts as Creative Director and oversees every pixel on sight, literally. When he's not creating or sleeping, he's probably dreaming of design. The social and numbers guy. After jumping aboard in 2009, his candid work ethic and ability for public relations helped build and maintain relationships. He is responsible for project management and ensuring customer satisfaction. When he's not on his blackberry or greeting a client you may catch him unwinding in Miami's nightlife. The marketing and media man. 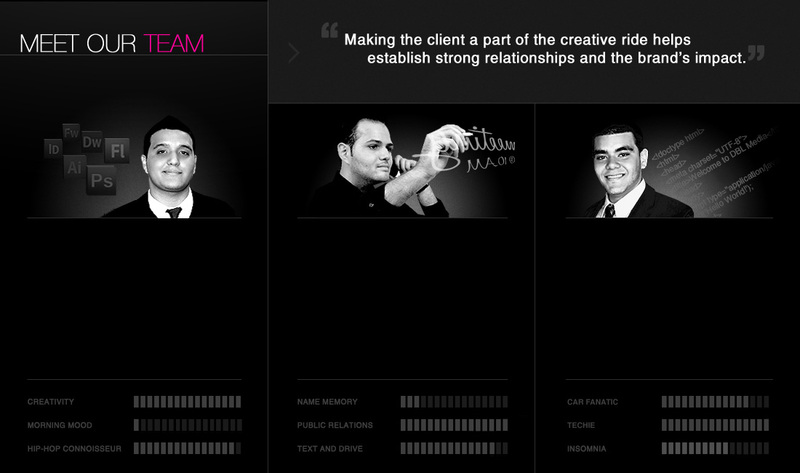 The newest asset to the DBL family, he is the right hand on every project developed in house. When hes not proofing jobs or keeping our clientele updated with the latest news, you may find him headphones on at task with the latest sounds. DBL MEDIA, LLC. © 2009-2014 Copyrights. All Rights Reserved.